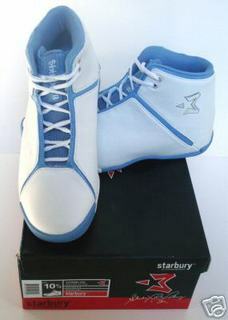 I bought a pair of Starbury One's based in part on this blog. What do I think of them? Well..... When I got them I had to try them on myself because no one works the Dept. where they're for sale. They were on the shelves with a couple of open boxes filled with shoes that had'nt been stocked yet. I got a size 11, one size larger than I usually wear. They fit, but it was hard to get past the tight lacing. The Sneaks look the part of BBall shoes, but are thinly made. There's clear plastic in parts that provide the Bling, but the odd inner-lined lacing at the top by the ankle makes them hard to slip on and off. I also noticed the inner sole padding came up when I forced my foot in the shoe. I got the All-Black Starbury's hoping they'd look like anyone else's shoe should these sneaks become a joke. That way from a distance no one will know I have them on. The Pleather that makes up the shoe is smooth across the foot with delineated plastic linings where your foot will move - joints to the part of the show that give way when you run and jump. It felt thin. The shoe isnt heavily lined ( that's where the cutback in price is found). When you have them on, you feel locked in at the ankle. The upper half of the shoe tightens up pretty solidly around the high ankle. It has the odd laces though, laces that line the inner lining of the shoe at the high ankle. It makes it harder to tighten up. Biggest notable is the sole. It's thin. Real thin. It's like walking in a padded slipper. Here's where they also cut costs. Running in these sneaks , you could tell they would'nt last a summer of Hooping it up on the court. With weak padding ( no sole/soul- kinda like Starbury's Game) you'll burn thru these shoes in no time. Either your feet will hurt or you'll be Gellin to keep them going. I guess that's the plan though. They're so cheap you can afford to go out and get a new pair. ...the tongue of the shoes looks like it's held in by cheap medical gauze. The leather is extremely thin, which means that the sole actually slips around when you walk. And the insole almost fell out when I pulled out the paper that they stuff into the shoe so it holds its shape. Well obviously you get what you pay for. The Starbury's are all over ebay in case you don't want to drop by a Steve & Barry's. Anyways, thanks guys for your posts on the Starbury's. 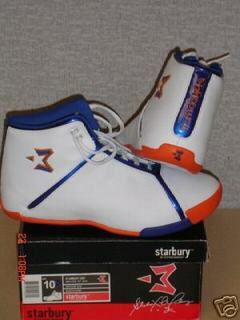 And if anyone else copped a pair of the Starbury's, feel free to let us know. Now I'm going to run down the UPS trunk for my delivery of the $250 Jordan IV Lightning Set... yeah right!!! http://sikis18.org/ - zetaclear toenail fungus Even though it may seem that we're all online all the time now, the truth is that we still have lives offline. That being said, even late night comedians are making jokes about Facebook. For example, Jimmy Fallon once remarked that he'd heard that Facebook was developing a new cell phone. He claimed that it was pretty good, but it only allowed a user to call people he or she barely remembered from high school. Even to the famous, Facebook is an experience most of us share, so naturally they'll mine it for laughs! in pc when i start playing this intro goes super slow like in slow mooitn and the stadium goes black you can only see the lcd screens and the players help? While there have been plenty of shoes with neon lighting before, the Starbury app brings a unique element to the sneaker.